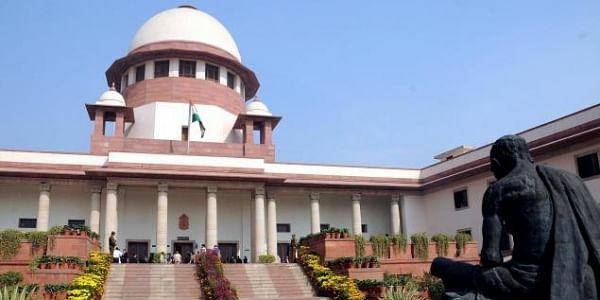 NEW DELHI: The Supreme Court today refused to entertain a plea of a BJP leader and lawyer seeking playing of the national anthem in all courts before the start of proceedings. A bench of justices Dipak Misra and Amitava Roy said it is not inclined to entertain the plea of BJP spokesperson Ashwani Kumar Upadhyay after Attorney General Mukul Rohatgi submitted that the petitioner should file a proper application. "Whether right or wrong, our order should not be overstretched. Bar (referring to Upadhyay) should show some retrain," the bench said. Earlier in the morning, Upadhyay mentioned the plea before the bench which had on November 30 made it mandatory for cinema halls to play national anthem before screening of a movie and the audience must stand and show respect. The bench has then sought AG's assistance to learn his view on the plea of Upadhyay. In its November 30 order, the apex court had said that "love and respect for the motherland is reflected when one shows respect to the national anthem as well as to the national flag. That apart, it would instill the feeling within one a sense committed patriotism and nationalism." It had said that when the anthem is played the national flag shall be shown on the screen and the order should be given effect in a week's time. The bench had also said that prior to the anthem being played or sung in the cinema hall, the entry and exit doors shall remain closed so that no one can create any kind of disturbance which will amount to disrespect to the national anthem and the doors can be opened once it is over.